Charcoal is a surprisingly useful colour in an odd jacket. Great with muted tones of tan, green or brown, it's also dark enough to go with lighter grey flannels. And charcoal is my favourite colour to wear with cream trousers. It tends to tone down their brightness, where navy seems to emphasise it. I’ve mostly done that with knitwear in recent years - as in my rollneck here. But I commissioned this donegal jacket from Steven Hitchcock with the idea of doing the same with a jacket. Of course, as a sports jacket it needs some kind of texture, and regular readers will know that I tend to stay away from strong patterns like checks. Instead I prefer herringbones and other prominent weaves in smart jackets. And in casual tweed ones, as here, I like the flecked pattern of Donegal or the multi-coloured yarns of Harris. My brown Dalcuore suit is another good example of a Donegal, while my Caliendo jacket shows the appeal of Harris tweed. This charcoal Donegal is from W Bill (WB34614) and is heavy at 15.5 ounces (440g). It’s similar to my Caliendo in that regard, and as a result is really outerwear - not to be worn around the office, but in transitional seasons like we have at the moment, instead of a coat. It could of course also go under a coat if needed, or indeed be layered with knitwear or a scarf to make it a little warmer. A reader actually asked in a comment recently what he should wear when the weather is so variable. I generally find that if you have two weights of jacket (like that Dalcuore and this Hitchcock) and have the option of adding knitwear or a scarf, you can cope with most of these temperatures. And if the day starts cold but warms up, you can take off the knitwear and scarf and put them in your bag. Here, I’m wearing a thin but long-sleeved cardigan from Brunello Cucinelli under the jacket. In terms of colours, I like the tonal play of the white shirt, pale-grey cardigan, charcoal jacket and cream trousers. The only downside to the combination is that without the jacket, the rest is rather pale. Darker knitwear (perhaps a muted green like the Finest Knitwear shade) would be a good substitute. 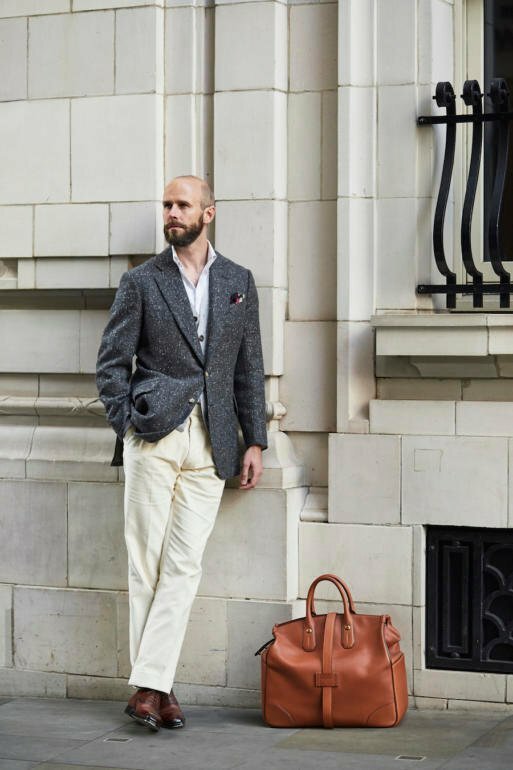 The shirt is a white-twill button-down from Luca Avitabile, and the trousers are cream cords from Pommella. Gianluca at Pommella made me the cords over the summer. It wasn’t easy finding a nice cream shade - even Brisbane Moss, with its multiple cord bunches, only had one in cream (T1 1699, 315g). There were several whites, but white in trousers is usually too stark and not as elegant as cream (linen in summer is the only time I'd wear it). Being cotton, the corduroy wrinkles a fair bit, and is rather more casual than something like my cavalry-twill trousers in Fox Brothers wool (also made by Pommella). But then the cords will also be a little more versatile and easy to wear casually with knitwear and so on. The shoes are my modern-Russian bespoke pair from Stefano Bemer that I covered here. 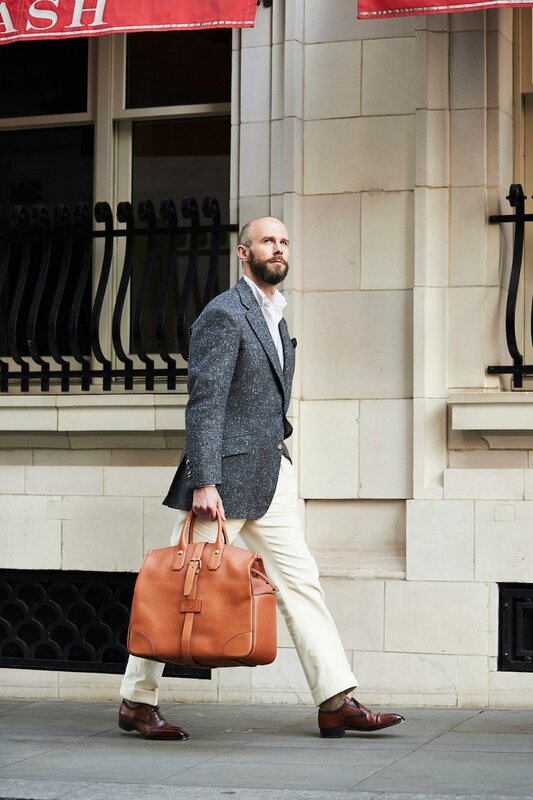 And the bag is one from last season from Dunhill. As readers will know, I have a big weakness for Dunhill’s top line of leather goods, currently known as the Duke range. It used to all be made in Walthamstow, but most are now made in Italy to the same hand-sewn level - just in softer leathers than the bridle usually used in the UK. The bag is big, somewhere between a doctor’s case and a weekender, but given the amount of clothing I carry back and forward to the office (plus food and gym kit) I’ll use it all. The only issue is weight, given it’s all leather. This wouldn’t make it great for travel, but on a commute where walks are always fairly short, it’s fine. Returning to the jacket, this is the third piece I’ve commissioned from Steven Hitchcock over the past few years, and if anything they’ve just been getting better. I’ve always liked the drape style for its broader shoulders and flattering chest, but Steven has also refined it, making some aspects (such as lapel line) a little sharper. He also doesn’t normally put the canvas on the bias now, which was a traditional technique to give more stretch, but could prevent the bottom half of the jacket being quite as sharp. Steven is also always working with consistent coatmakers now, and still cutting everything himself - something he recognises is a limit to growth, but wants to maintain. He has also added San Francisco to his US trips, and will be there on October 23rd and 24th - after New York, Washington and LA in preceding days. Details on our Trunk Show Calendar, as always. Suits start at £3600 plus VAT. Pocket square from Christian Kimber. You can follow the discussion on Charcoal donegal-tweed jacket – from Steven Hitchcock by entering your email address in the box below. You will then receive an email every time a new comment is added. These will also contain a link to a page where you can stop the alerts, and remove all of your related data from the site. I’m very fond of that tweed Simon- reminiscent of granite. I have a blue jacket from that bunch but could quite happily commission a green and charcoal as well if means allowed. For clarification, the corduroy of the trousers is from Brisbane Moss? Do other mills offer more selection in terms of cream shades? Would you consider cashmere-cord for odd trousers? On what basis do you choose between the English drape practioners (Hitchcock, A&S, Steed)? What do you find the differences between them to be? Yes, it’s from Brisbane Moss. There are some others from mills, eg Scabal, but Brisbane has the greatest range of colours and weights. I’m not sure if others have a cream. I would avoid cashmere/cotton for odd trousers. I did it with my Pirozzi suit, and it’s nice to have in the jacket, but the soft cashmere isn’t great for trousers. How far off is W&S? In what sense? They are similar in style in some respects, but with less drape and sharper. I wouldn’t describe them as a classic drape cut. Quality is very good. I thought they were more drapey… anyone who cuts drape for lower down the price spectrum? Yes some drape, just not as much as the others. Try not to push for lower prices everywhere if you can – unless there’s a clear thing you’re giving up, like UK making in the case of W&S. There’s no short cut to a good jacket, and low prices is what supports young visiting Italians, who end up sacrificing communication, regularity, and often quality. This is the best shoulder I’ve seen on any of your coats. I am inclined to agree. Simply magnificent! Reg. Hitchcock “if anything they’ve just been getting better”. Now, i”d say that is an understatement looking at the fit alone. It simply has to be one of the best fitting jackets i have seen in a very long time. I know one should be careful judging solely on pictures posted on the web, but still….! I am very impressed by mr. Hitchcock & what he has achieved here. He truly is a master tailor. One other interesting point re fit: The jacket was a little roomy but I deliberately kept it that way, as I want one I can easily wear chunkier knitwear underneath. And a jacket that is a little big will often look like a cleaner fit. Apart from the fact that it certainly does not look to roomy, you make a very good point here. Interestingly i insist on the same with my jackets from my tailor in Tuscany. My experience is that my jackets, no matter weight of the cloth, “settles” & shapes much better & more comfortably to my body with just that little extra volume. Also i must admit that, although i am a big fan of a softer tailoring, i also detest some mens inclination for too short & slim jackets. Same goes for trousers i might add. I think it must be a common request. Steven’s made me two tweed jackets, and both times he asked me if I wanted to leave them roomy for knitwear (which I did not do). Interesting to see you went for slanted pockets here, which you normally don’t. Any particular reason? Personally not a fan of them. Not really a fan either. I usually find them to affected somehow. But seeing them on this particular jacket, i have had to reconsider. I think it really works & accentuates the lines of the jacket, which is strange as it is actually rather modest & restrained looking overall. TBH, i think it would have been a pity to have gone with say patch pockets. Was the comment of taking a lot of clothes to the office an old habit or have you set up offices for Permanet Style now? What happened to the bread article that was top of the page this morning? I now work out of a shared space, which is lovely but does mean less space for keeping clothes here… Just means I can’t cycle in as much. That article was scheduled for Friday. Not quite sure why it went up this morning. You got a preview! Doesn’t the rule about wearing light coloured shoes with dark coloured trousers apply in reverse? I’d have thought that the same principle – excessive contrast / lack of harmony dragging the eye downwards – would apply? I wouldn’t generally say so, no. Even dark-brown shoes can work with cream trousers. And while these tan shoes create quite a lot of contrast with the cream corduroy, any colour would except something like pale grey or a white buck. I’d say that rule has less to do with contrast than the simple fact lighter colored shoes tend to pop more and thus break the line and shorten your figure the same way cuffs would. The lower quarters seem virtually closed. Would it look weird (irrational) to have open quarters with a heavy winter fabric? I wouldn’t say they were that closed (also not easy to see on these pictures). More just English standard, and indeed not as closed as some others such as Richard Anderson. In terms of having them more open, the fabric wouldn’t make much difference for me, but having too open or rounded quarters might seem a little odd with the still structured and sharp lines of the English tailoring elsewhere. The “closed” quarters caught my eye too. I struggle with being able to see someones belt when they are simply standing upright – but maybe that is just me. The charcoal and the cream looks great! One question though, the photo’s do not make the jacket look short, but when I look at where the low point on the jacket is against your arm/hand when it is by your side it seems short – mostly I have been told that the bottom of jacket should be in line with the end of your thumb. Am I seeing this correctly? Simon, why didn’t you go this time too with a Neapolitan maker for what is, in the end, still a relatively casual jacket? Is this also why you chose flap pockets? I have seen that you mostly use patch pockets on your Neapolitan sport coats? Interesting choice of buttons. Did you choose the light horn buttons knowing you would be pairing the jacket with cream trousers frequently? I would normally think of using dark brown or dark grey buttons on a jacket like that. Regarding the pocket square, I just got one from CK, but find it, as appealing as the graphics and texture are, a bit too bulky. Has this been your experience? It is the larger size, but the same size as most handkerchiefs – only a few, often linen squares are smaller I think? I saw this coat hanging in Steven’s atelier a couple of weeks ago. I thought it looked very good then, and it looks most excellent on you now. Congratulations. Steven has been coming to San Francisco for at least a year, now. This upcoming visit will be, I think, his third. I shall see him and Celia on October 23rd for a fitting of my second commission with him. See you wandering past MASH on this shoot. Do try it; by far the best of the “steakhouses” out there. 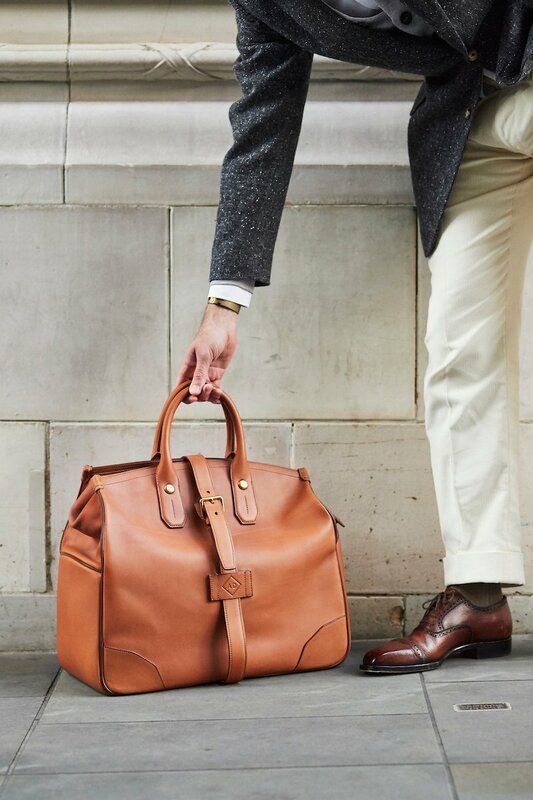 The Dunhill bag is awesome, is that the Duke Tan Small Zip Tote or the large one? Very attractive, modern cloth. Cut is fine though doesn’t carry the same elan as with your Neopolitans. Perhaps, in this sense, it proves your thesis on casual or separate jackets? My issue though, is with the colour – I don’t think it works as a casual foil to the cream. Indeed of all the go-to casual jacket colours, especially in summer, mid to dark grey seems the least useful as it always carries the shadow of colder months and business or more formal dress. Armani uses a pale, almost silver grey but in light, loose silhouettes. I disagree about the blue – it is perfect with cream as it reflects the maritime heritage of the blazer – but is more suited to warmer climes. In warmer months there are also so many other colours to go to if blue (or grey) are not preferred (paler shades of green and brown, lilac, mauve, pale powder blue etc.). 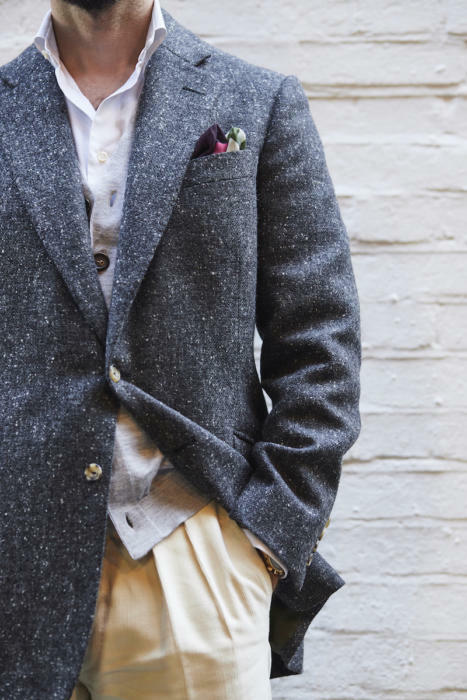 Hi Simon, what are the most casual trousers / shoes one could wear with a drape style tweed jacket? That is actually the same pocket Square from Christina Kimber that I wore to our Huntsman dinner last year. I just turned that bordeaux side all the way out! Oh, and very nice cloth. I seem to be having the same issue with not being able to wear my heavier jackets around the office these Days as they turn the heat up in here like crazy. Sadly, I am considering lighter fabrics for this reason. But maybe there is a workaround. I shall explore. I quite like the cloth, cut and finish of this jacket albeit the pockets are a faux pas and should have been patch sides / regular breast. Beyond that though, the overall image is way too ‘look at me’ and verges on cos play. Each individual item could be good with something else but together it is all too much. Even the bag shouts ‘new’ and the shape is reminiscent of something a vet might use. Understated style this is not. Simon, at one point I think you said something like your aim was to wear clothes that people would remember as being elegant and well made but without them recalling specifics. Is this still the case ? Sorry but understated style this is not. Thanks for making your point Jason. Twice. Do try to avoid the personal language please, it’s not really necessary. You’re certainly right that the outfit is more showy than most I wear ( as with recent cashmere jacket). And the bag is of course actually new, so not much that can be done there. Given the leather, it should wear in well. If someone wanted to be less showy than this, they could easily do so, and only by removing the bag and pocket square. There is nothing else peacock-like going on, like bright braces, bold patterns or a tie and tie pin. I’ve always thought of grey coats, be they tweed, herringbone etc.,as being the domain of academics/lecturers/nutty professors. Far happier in the greens/rusts/blues for this type of coat. Interesting. I’ve always associated academics (in the UK, the reference is normally the Geography teacher) more with more country colours. Greys feel more urban. I guess it’s very cultural. Why would not having patch pockets on such a jacket be considered a faux pas? Should odd jackets always have patch pockets, and should suits always have flapped pockets? It would not, it’s not a faux pas. That’s unhelpfully extreme language. Generally more casual jackets suit patch pockets. And smarter ones look better with flapped ones. It’s part of a general rule that having extra things on the jacket breaks up the visual impression, makes it look less sleek, and therefore more casual. Although this is a casual material, it is a dark colour and a smart cut. It’s perfectly good with flapped pockets. Thank you. That is very helpful. With your answer in mind, then, could one have a suit made in a relatively smooth cloth, but with patch pockets so the jacket can be worn as a separate? Or would this be an unharmonious mingling of conventions, ‘neither fish nor fowl’? I notice that many odd jackets in Ring Jacket’s line appear to be made of a smooth cloth, have flapped pockets, and have buttons in the same colour as the cloth. Surely these should have patch pockets because, unlike your lovely jacket above, they do not have the textured cloth to position them as a definitive odd jacket and not an orphaned suit jacket. There are no hard and fast rules here. 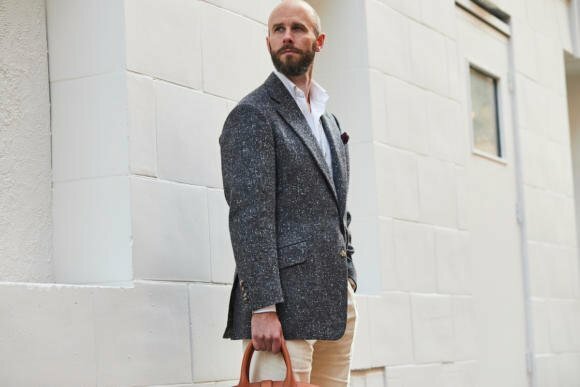 In general, texture will make a jacket more casual, as will patch pockets and contrast buttons, but pattern and lighter or stronger colours can also help there (basically the opposite in every way from a navy suit jacket). So the Ring Jacket models might have some other mix of these things. You could have a smoother cloth (eg a cashmere) for a jacket and patch pockets would help. But not a worsted wool like a suit is made of. And I am commenting purely from a UK perspective. – What do your colleagues wear? – I assume you’re in the US. Do you think it’s American, or international? You are correct in your assumption – I teach at a liberal arts college (what you would call a University) in the Midwest. A handful of my male colleagues wear sportcoats or navy blazers; the majority are more casual – sweaters, open-neck shirts, flannel shirts, even sweatshirts. Administrators usually wear conservative dark suits unless they are intentionally trying to appear informal and approachable. I purposefully cultivate a slightly anachronistic tweedy professor look, which is why I scour the Internet for vintage British tweeds (I have a pretty good alterations tailor in Indianapolis.) Right now, however, it’s still 85 degrees outside, and I am wearing a cream raw silk jacket! My art teacher at school (I’m going back a few years here) trained at Slade, always wore a grey tweed, with leather elbow patches AND cuffs, pockets rammed full of pipes, tobacco pouch, bits and bobs, baggy cords of various shades of mustard, olive, shaggy beard and wild unkempt hair. We all thought he looked rather cool, unlike the masters of Latin, Geography and Economics, who were a little dull in their attire. The tweedy look definitely had a “professor” connotation (especially in the Ivy League) in the past. I feel that this connotation has been fading recently as the popularity of tweed has increased again. The slanted pockets remind me of your Saman Amel jacket where the angle was reversed. Which way do you prefer? Really? But the Saman Amel pockets had tops that slanted forwards, and these slant back? It’s actually much closer to your Rubinacci donegal in my opinion. Which makes it a bit surprising you’re saying you’re still not sure whether you like the look of them (the slanted pockets). I applaud Simon’s wish to experiment- because of this we are able to discuss the colour, cut and, it seems, the pocket type in length. If Simon played safe, without variation, the site would not generate the interest and that it does – all healthy stuff. The ensemble may divide opinion (it’s not for me), but it certainly arouses further thought… such as the use of slant pockets and what they comparatively add to my jackets. Further thought for the next purchase. Lovely harmony of colours Simon. This will probably get my vote for the best of 2018. 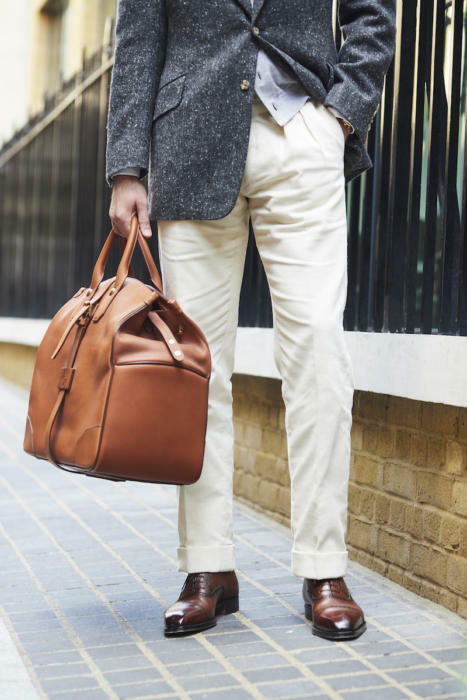 Keep the buttons, I’m sure you’ll be pairing with the cream trousers more often than not. Nothing to criticise here (not that I ever would). Why are so many readers so confused (and unhappy) by the slanted pockets? 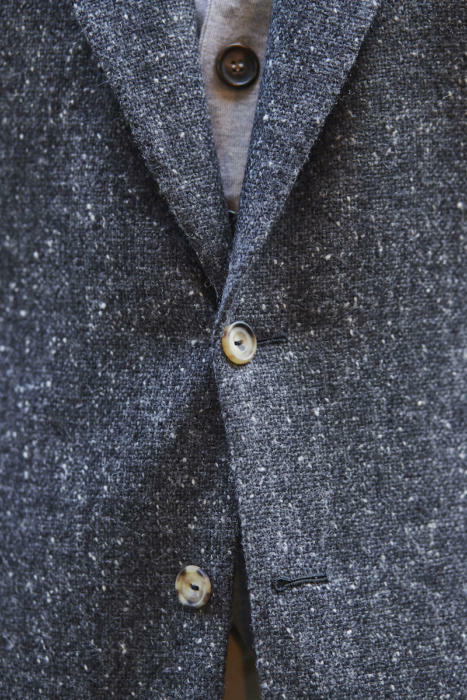 Doesn’t traditional English tweed jacket have slanted hacking pockets? Calling it a faux pas is just ridiculous in my opinion. For me this outfit does not go together very well. 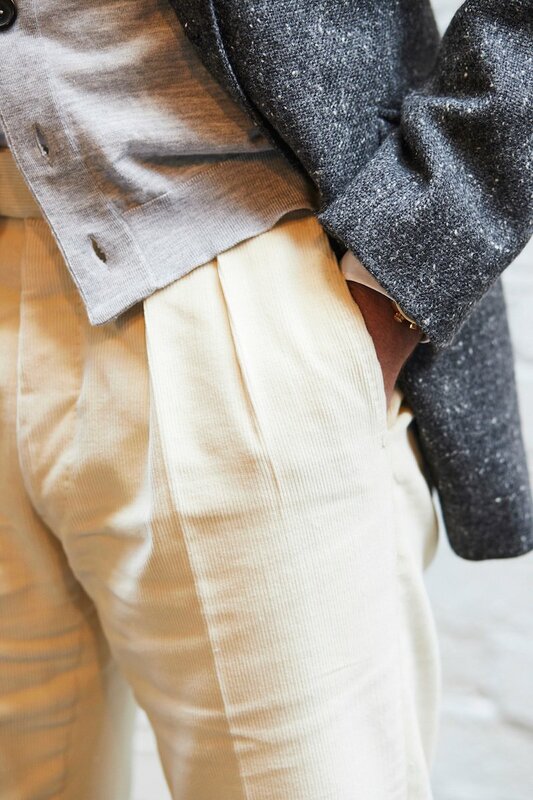 The grey jacket looks too dark, rough and heavy to be combined with such a nice light trousers. Both piece are well made but I would not combine them. There is something with the shirt too, maybe a tie is missing. As for the shoes I think they go well with the trousers but it seems that the edges of the leather are colored darker, why would you do that? For decoration? Thank you for showing us. It is often very difficult to combine garments perfectly. I agree with Peter on the jacket/trouser combination. Its just doesn’t sit well with me. But I disagree on Peter’s comment on the shoes… which is why I enjoy reading both the articles and the comments on PS! Even though I am not in a position to spend my way to a PS wardrobe, and to be honest I don’t work in an environment which would enable me to wear such a wardrobe without feeling like a peacock, the articles and comments on PS encourage me to think about my own wardrobe and to make sure I buy the best I can. And then have it altered by a tailor, obviously. Keep up the good work Simon, and you too comment makers. I think the color of the shoes is just fine and a very good match to the trousers. Also the socks are perfect. I was refering to my impression that the leather has been colored darker on the edges of the punched pieces by the shoemaker. I see it quite often nowadays that the leather is colored partially darker and I personally do not like that. It makes me think on a fake effect. I hope it is more clear now. I much prefer slanted/hacking pockets to the typical horizontal ones. I think they should be the standard when it comes to flapped pockets on suits and jackets. More comfortable and easy to access and visually accentuates the jackets waist suppression while helping to draw the eye up and along the jacket lapels instead of cutting straight across. I think it also helps the garment appear rather modern and makes it a bit more versatile in terms of what trousers you can wear with it. This is a really lovely jacket. I’m not a great fan of Donegal tweed, but this has a very contemporary look that I like a lot. Personally, I think that the slant pockets are fine. If it was a lighter cloth I’d be straight on to someone to make me a jacket in it! I’m not a fan of the drape cut, in general (not specifically this jacket). I have a couple of things from W&S, with a modest amount of drape that I can cope with, though I’d be happy with a little less. I’ll continue to use them because the quality of both product and service is good, as well as being superb value for money. As a UK academic (though not a geography teacher!) I have to say that I’d be grateful for colleagues wearing a decent jacket in any colour or cloth. So many academics dress in a manner that makes it difficult to distinguish them from the students at times and even some very senior university leaders have succumbed to the current fad for wearing uniform black, blue or grey suits with open necked business shirts. It would be a joy to see colleagues dressing in a manner similar to the one illustrated here. It’s very interesting how you managed to make cream trousers an all year alternative by choosing appropriate fabrics. Regarding the jacket, may be inquire about the cost? I know you’ve given an example for a suit, but I wondered what the jacket only would be? Should we assume 75%? Hi Simon. I think this jacket will evolve with time…a suggestion therefore. Given the ensemble’s slightly mixed reception might it feature at a later date within a different context – matched with alternative items (autumn/winter) – an article on versatile pieces perhaps? Concerning Dunhill bag: Any comment on quality of the English made cf. European made? Any price difference? What leather goods still made in London? Know if the London factory will cease production altogether? Great jacket and outfit. And I couldn’t agree more on the quality of Steven’s work. What I can’t quite get my head around is this concept of a jacket for outerwear (which you’ve also mentioned regarding your lovely Cifonelli suede jacket). With the exception of the summer months – when I wouldn’t wear this kind of thing anyway – I spend most of my time indoors, and I assume that’s the case for many men who work in an office environment. Given this, doesn’t it seem a shame to lose all the benefits of the jacket for most of the day, for an outfit you can only wear “in transit”? Wouldn’t a jacket in a slightly thinner material, worn with a thin overcoat that can easily be removed, be more practical? True. Then again not everyone wears a jacket under a coat or even any weight of jacket around the office a lot of the time. Simon – if you were to commission a summer sports jacket in the English “drape” style from a tailor like Steven, what material would you recommend? Thanks. My question was more about are there summer fabrics that are more suited to the English (more structured) style vs. Neopolitan. Absolutely love this jacket! 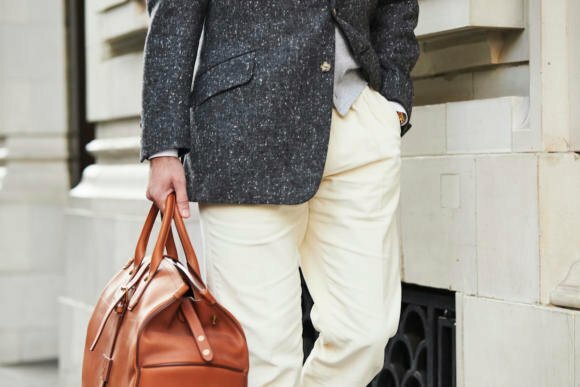 You mentioned that charcoal is quite versatile: “Great with muted tones of tan, green or brown, it’s also dark enough to go with lighter grey flannels.” I’m having a charcoal sport jacket made, and I knew it would go well with light grey and cream pants, but you think green and brown pants would be acceptable pairings, too? I’m admittedly a bit skittish when it comes to unfamiliar pairings. I’m commissioning a winter sport coat from Steven next month, likely a mid-weight, small scale puppy tooth in the brown and cream spectrum. I was considering going with patch pockets (with normal breast pocket), particularly given how good Steven is said to be at pattern matching. Do you this works or would you go for a more formal flap or jetted pocket given its still an English cut, albeit soft. Thank you sir. It could still work, but I’d probably go for a flapped pocket. I just don’t like the shape of the English patch hip pockets – they’re so large and square. Yes, a cardigan would be more casual. But in that case I wouldn't use a tailoring material like flannel. Use knitted wool or cashmere.